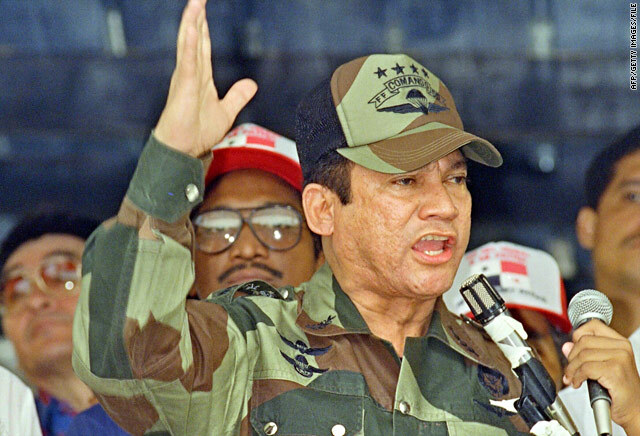 In this file image Manuel Noriega addresses a military event in May 1988 in Panama City, Panama. (CNN) -- Once one of Central America's most notorious military strongmen, former Panamanian dictator and convicted drug trafficker Manuel Noriega has been a prisoner since being toppled from power in 1990 in a U.S. invasion. For almost two decades, Noriega was a major player in a country of critical regional importance to the U.S. because of its location on the Panama Canal, a key strategic and economic waterway between the Atlantic and Pacific oceans on the narrow isthmus linking the Americas. Born in 1934, Noriega was abandoned by his parents at the age of five and raised by an aunt in a rundown district of Panama City. After failing to get into medical school, Noriega joined the army, studying at Peru's Military Academy of Chorrillos and quickly rising through the ranks. In the 1970s he served as head of military intelligence to General Omar Torrijos, who had seized power in a military coup in 1968. Torrijos' death in a plane crash in 1981 saw Noriega emerge as his de facto successor and by 1983 he controlled both Panama's armed forces and civilian government. 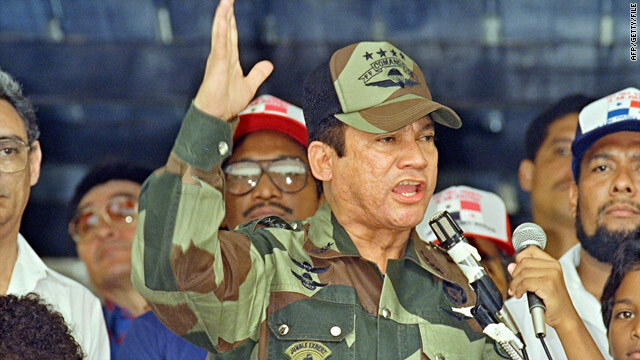 Noriega's rule saw a breakdown in relations between Panama and the U.S. with Washington cutting off economic and military assistance and freezing Panamanian government assets. In 1988 Noriega was indicted in the U.S. on charges of racketeering, laundering drug money and drug trafficking. He was accused of having links to Colombian drug lord Pablo Escobar's notorious Medellin cartel and, in the process, amassing a multi-million dollar fortune. Amid growing unrest in Panama, U.S. President George W. Bush ordered the invasion of Panama in December 1989, claiming that Noriega's rule posed a threat to U.S. lives and property. With more than 20,000 U.S. troops on Panamanian soil, Noriega took refuge in the Vatican embassy for 10 days, eventually surrendering to U.S. Drug Enforcement Agency officials on January 3, 1990, after U.S. troops had surrounded the compound with loudspeakers playing deafening rock music. Noriega's trial in 1991 was dubbed the drugs "trial of the century" by the U.S. Drug Enforcement Agency and eventually saw him found guilty on eight counts and sentenced to 40 years in jail. Noriega was the first foreign head of state to be convicted in a U.S. court, but the trial also led to revelations that Noriega had been a paid CIA asset for many years. Amid procedural wrangling over what should be permissible in court, Noriega claimed to have earned almost $10 million from his intelligence work, while the U.S. government offered to stipulate he had been paid just $320,000. But Noriega was prevented from revealing specific details of his work for the CIA -- a ruling upheld by the U.S. Court of Appeals which said revelations about Noriega's intelligence work would have "shifted unduly the focus of the trial from allegations of drug trafficking to matters of geo-political intrigue." Noriega has since said his relationship with the U.S. soured when he refused to participate in acts of sabotage against the communist Nicaraguan government during the Cold War-era, anti-communist efforts spearheaded by the CIA in Central America during the 1980s. The CIA has not commented on Noriega's claims. Granted prisoner of war status following his trial, Noriega's sentence was later reduced to 30 years and he was due for release on parole in 2007. But he remained in captivity pending a decision on a French extradition request. A Paris court had convicted Noriega in absentia in 1999 on charges that he had laundered $2.8 million in drug money by buying property in France. As part of an extradition deal agreed in April and signed by U.S. Secretary of State Hillary Clinton, France agreed to hold a new trial and to uphold Noriega's prisoner of war status. Noriega's attorneys argued that the United States was violating the Geneva Convention by not sending him back to Panama, which has also demanded his repatriation to stand trial on murder charges. Although Noriega was sentenced to 60 years in prison in absentia, Panama has said he would receive a new trial. But some say Noriega would likely be treated leniently in Panama following an amendment to the country's criminal code in 2008 allowing criminals older than 75 to serve their sentences under house arrest instead of in prison. "For us, it is better that he is serving time in prison in another country," Alida Benedetti, an attorney and former human rights activist in Panama, told Time magazine. "He deserves jail. He killed a lot of people. We don't want him back." In his testimony to the French court, Noriega revealed more details about his former relationship with U.S. officials. "I received high praise from the U.S., Interpol and other countries who all benefited from my fight against drugs," he told the courtroom, adding that he had been "especially in contact with the CIA." Noriega's attorneys argued that a 10-year jail term amounted to a life sentence for an elderly man who suffered a stroke and was treated for prostate cancer while in prison in the U.S. In a recent interview with CNN, conducted before Noriega's extradition to France, the former dictator's grandson, Jean-Manuel Beauchamp, said his grandfather was "ready for anything." "He's the smartest man I know. He's so friendly, outgoing, knowledgeable. He's always looking to teach or give advice," said Beauchamp. "He's ready for anything. He's probably developed strategies, in his own mind, to emotionally prepare."